Oct 14, 2016 at 08:58 AM | 875 Views | Last edit Oct 14, 2016 at 11:28 AM 4 rev. I reported a feature request in BETA that is very important for us and which has been partly implemented. It had 2 parts. One was about filtering per tag and this has been implemented (Thank You!). The other one was to have the ability to filter for questions with zero responses which is still not implemented and I did not find this in http://go.sap.com/community/about/beta-feedback.html. Questions with zero responses <<< this one would be very important for us! The main page https://answers.sap.com/questions/index.html?sort=active&filter=unanswered behaves almost how I need it (almost as it is not tag-specific, but the global queue of questions). wait, we can filter by tag ?? HOW ??!? I don't see this option anywhere. well, that means when I go to Q&A section, I can't filter on a Tag I follow, which sort of defeats the purpose. Now I have to scroll/page thru my activity stream to find things to answer/comment/follow. I don't think that is Simple or Efficient. But that's not what happens on the page you linked to. So I have no idea what's going on. I can't think of a reason why these two pages should behave differently. I'd like to list threads with 0-Responses (and only those (!)). I understand that currently "Unanswered Questions" is about "NoBestAnswer-threads" and this is an absolutely valid feature too, but not what we are interested about. This is why we'd require an option for "Questions with zero responses" that would behave as I highlighted with yellow on the above screenshot. Go to say https://answers.sap.com/questions/metadata/22872/sap-business-one-1.html and try to list only those questions where you see "0 Replies". This is not possible. 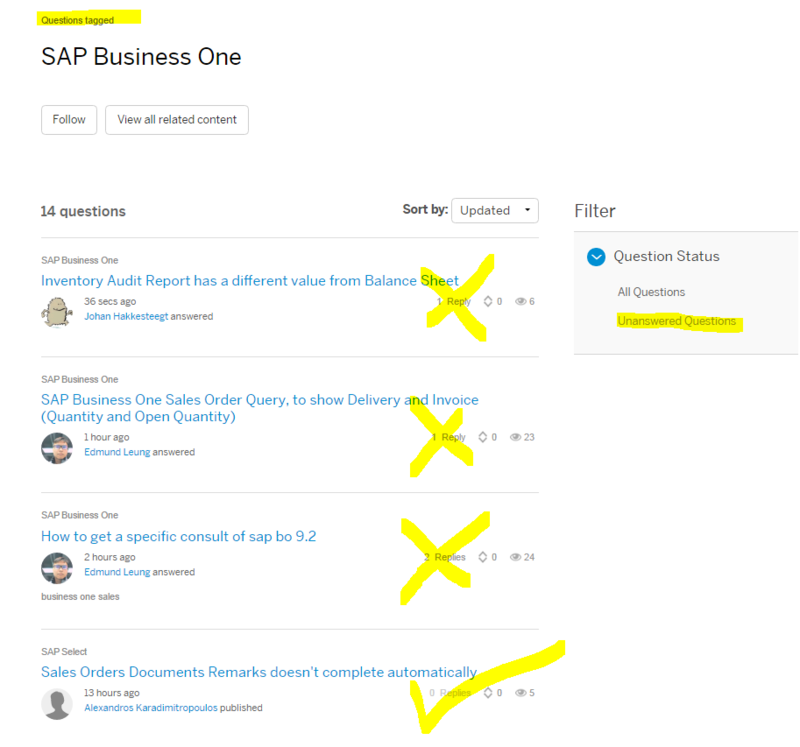 Alternatively, can you please navigate to a tag related Q&A page like this one https://answers.sap.com/questions/metadata/22872/sap-business-one-1.html and help me how I can list only those that are displayed in the list as "0 Replies" ?